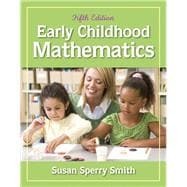 Early Childhood Mathematics, Fifth Editionis the most, widely used guide for educators on teaching mathematics to young children in Kindergarten through Third Grade. Practical and applied, this trusted and research-based book encourages teachers and teacher candidates to create an active learning environment that fosters curiosity, confidence, and persistence in children learning mathematics. Expert author, Susan Sperry Smith relies heavily on the most current research in the field, aligns core content to the NCTM Standards, presents information on Cognitive Guided Instruction (CGI) and necessary adaptations for students with special needs. The book covers the most important key concepts for teaching math in the early years with three over-arching themes: knowledge of important mathematical relationships, number sense, and the ability to solve problems. The fifth edition builds on the reliability and excellency of previous editions with new information on meeting the educational needs of all students, the importance of STEM careers beginning in early childhood education, more activities, thematic unit, and curricular tools, multicultural literature and activities, a comprehensive update on The Common Core State Standards, NAEP, and the new DAP Position Statement. Susan Sperry Smith began her career by working in the projects on the West Side of Chicago and teaching first grade. Later, she received her master’s degree in Learning Disabilities and eventually taught severely disabled children, ages 6-17, in a small town in Indiana. Thereafter, she moved to Milwaukee and completed her PhD in Urban Education at the University of Wisconsin-Milwaukee, and teaching junior high boys with learning disabilities for the Milwaukee Public Schools. While at Cardinal Stritch University, Smith designed and taught the course, “Math for Young Children.” Half the semester was spent in an actual clinical setting where her students gained authentic experience by teaching in a local city school. Throughout her career, she led seminars and workshops on early childhood mathematics in Wisconsin and Upper Michigan. She also attended a plethora of workshops on Cognitively Guided Instruction (CGI) sponsored by the faculty at the University of Wisconsin in Madison. After twenty-six years of university teaching, she retired to Green Valley, AZ, to research and write.